When you think of a cracker, what do you expect? Perhaps something made out of white or whole wheat flour, with some seasoning, and a whole bunch of other ingredients you can’t pronounce. 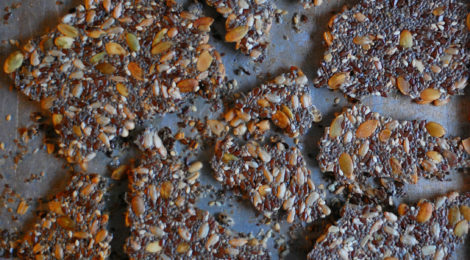 Maybe you could expect some seeds or nuts that are added for a crunch, or some kind of dried fruit for extra sweetness. Overall though, my general idea of crackers are kind of, boring. I mean really, the most exciting thing about generic crackers is what you are dipping them in or spreading on top. Am I right? To be honest, I’m a chip girl, but these crackers; these are different. What if you had a cracker that was not so boring? Something you could make very easily at home. A cracker you could not only pronounce the ingredients, but all of which you likely already had in your pantry. Would that make you more excited to eat them? What if those crackers were void of anything artificial and compromised of in fact, just seeds? Gluten free? Check. Grain free? Check. Dairy, egg, nut, and soy free? Check. Check. Check. Check. 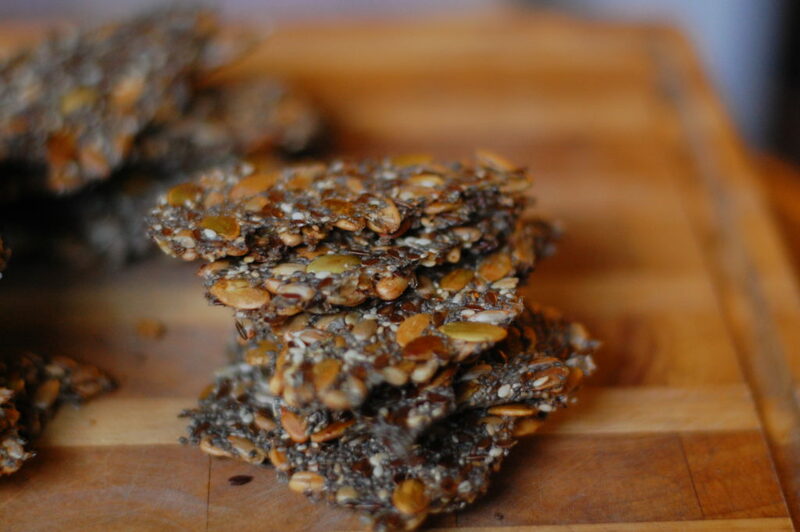 These seed crackers are made up of, well, exactly what you’d expect them to be; just seeds. And okay, some water, salt, and thyme for flavor, but that’s it! There is no nonsense here. Don’t believe it could be that easy? I guess you’ll just have to try for yourself. And do share with the family, and friends, and anyone else you know because I bet they will be a big hit. Say hello to your new favorite go-to snack. For the kids going to school (or unschool). For the parents who don’t have time to think about it. For the picky eater and the healthy eater. Make these ahead and be prepared to snack. All. Week. Long. 1. Combine all ingredients together in a bowl and let sit for 5-10 minutes. 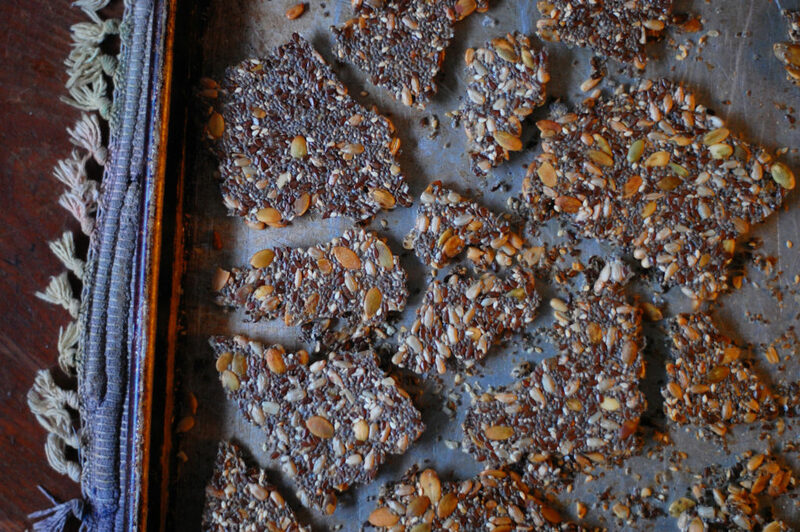 This allows the consistency to become gelatinous (from the chia and flax seeds) which helps this mold into a cracker. 2. While you wait for your mixture to sit, preheat oven to 340° (for a gas oven) or around 325° (if electric oven). 3. 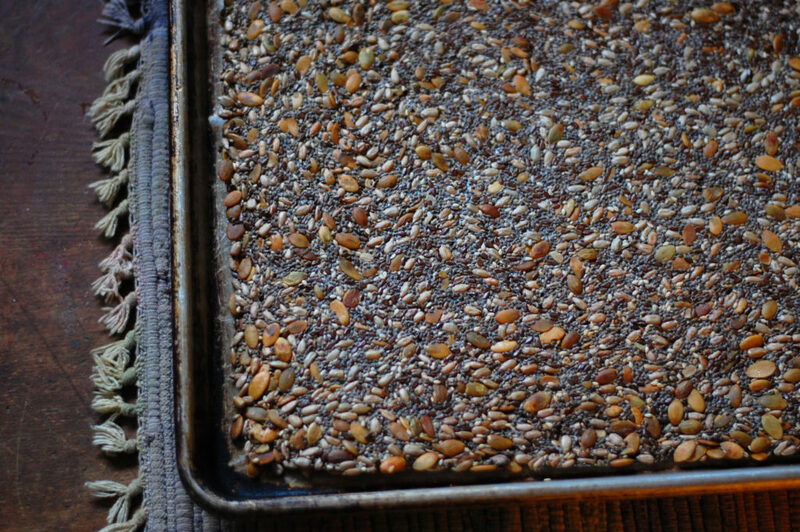 Mix your seed mixture well and use the back of a spatula to spread out on a large baking pan. You want the mixture to be about 1/4 inch thick. 4. Bake for 1 hour, rotating half way through, or until crispy and golden brown. 5. Break into chunks and store in a air-tight container.